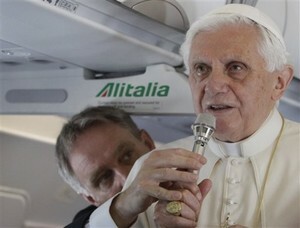 On the plane to Scotland this morning the Pope held the typical Q&A session with reporters. THE more important of the Q&A, in my opinion, is noted below. The questions are vetted prior to the asking. The UK, like many other Western countries - there is an issue that you have already touched on in the first answer -it is considered a secular country. There is a strong atheist movement, even for cultural reasons. 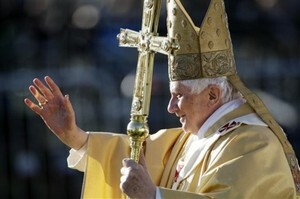 However, there are also signs that religious faith, particularly in Jesus Christ, is still alive on a personal level. What can this mean for Catholics and Anglicans? Can anything be done to make the Church as an institution, more credible and attractive to everyone? I would say that a Church that seeks to be particularly attractive is already on the wrong path, because the Church does not work for her own ends, she does not work to increase numbers and thus power. The Church is at the service of another: she serves, not for herself, not to be a strong body, rather she serves to make the proclamation of Jesus Christ accessible, the great truths and great forces of love, reconciling love that appeared in this figure and that always comes from the presence of Jesus Christ. In this regard, the Church does not seek to be attractive in and of herself, but must be transparent for Jesus Christ and to the extent that she is not out for herself, as a strong and powerful body in the world, that wants power, but is simply the voice of another, she becomes truly transparent for the great figure of Christ and the great truth that he has brought to humanity. The power of love, in this moment one listens, one accepts. The Church should not consider herself, but help to consider the other and she herself must see and speak of the other. In this sense, I think, both Anglicans and Catholics have the same simple task, the same direction to take. If both Anglicans and Catholics see that the other is not out for themselves but are tools of Christ, children of the Bridegroom, as Saint John says, if both carry out the priorities of Christ and not their own, they will come together, because at that time the priority of Christ unites them and they are no longer competitors seeking the greatest numbers, but are united in our commitment to the truth of Christ who comes into this world and so they find each other in a genuine and fruitful ecumenism. The evangelization of culture is all the more important in our times, when a "dictatorship of relativism" threatens to obscure the unchanging truth about man's nature, his destiny and his ultimate good. There are some who now seek to exclude religious belief from public discourse, to privatize it or even to paint it as a threat to equality and liberty. Yet religion is in fact a guarantee of authentic liberty and respect, leading us to look upon every person as a brother or sister. 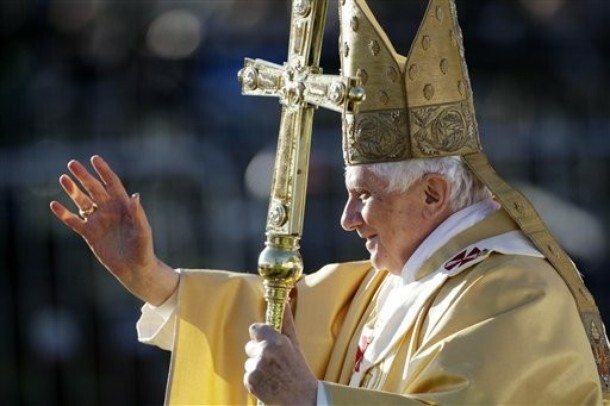 For this reason I appeal in particular to you, the lay faithful, in accordance with your baptismal calling and mission, not only to be examples of faith in public, but also to put the case for the promotion of faith's wisdom and vision in the public forum. Society today needs clear voices which propose our right to live, not in a jungle of self-destructive and arbitrary freedoms, but in a society which works for the true welfare of its citizens and offers them guidance and protection in the face of their weakness and fragility. Do not be afraid to take up this service to your brothers and sisters, and to the future of your beloved nation. how any true notion of what true welfare of people is be neglectful of the unborn, the elderly, prisoners, children, the poor and homeless, etc? Now are the times that I wish God kept Father Richard John Neuhaus and Cardinal Dulles among us! In case you haven't noticed, what the Pope is talking about here is exactly what groups like Communion and Liberation and Opus Dei are doing what the Holy Father asks to happen in the Church and society. This page is a archive of entries in the Faith & Reason category from September 2010. Faith & Reason: July 2010 is the previous archive. Faith & Reason: October 2010 is the next archive.